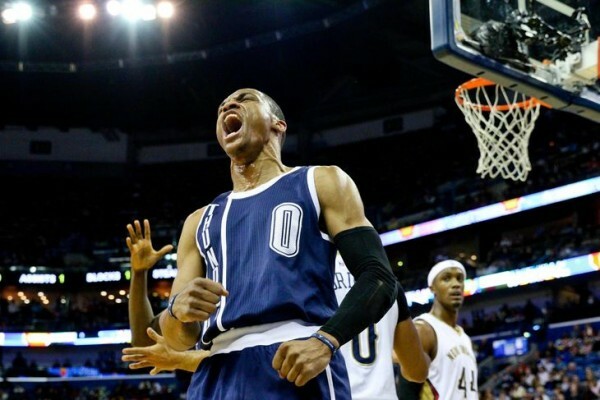 Oklahoma City Thunder – Is Russell Westbrook Really MVP Worthy? The rise of the Oklahoma City Thunder to capture what right now grants them a playoff spot is mainly attributed to the excellent basketball Russell Westbrook is playing. Always an excellent debate and discussion topic on good and bad days, this is the season he’s finally taken seriously as an MVP candidate. But can he actually win it? Last season, despite Kevin Durant winning the MVP, we started hearing a lot more about the possibility of Russell Westbrook being the better player in this tandem. Durant won the MVP award by a landslide, but this season, even after Durant came back from his injury (and went down again, and again, and again…), Westbrook has been the main go to guy for the Thunder. Even a team without a real offensive system needs a clear hierarchy, and it seems things work better with Westbrook playing like he was born to play. The numbers don’t put him on top of the list of candidates, but he’s closer to the award than he’s ever been. One thing worth remembering: Westbrook is leading the NBA in usage percentage, which means no player in this league gets to see more of the ball and command more of the plays than him, which helps his numbers seem so dominant. He has also missed 14 games this season, but that’s not going to be the reason he doesn’t win the MVP. So where does Westbrook stand out? He’s second in the NBA in scoring, averaging 26.1 points per game. But as we said, he sees more of the ball than anyone else – more than LeBron (5th), Harden (8th), Stephen Curry (12th) and Anthony Davis (19th). His assist percentage leads the NBA (47.4%) for similar reasons. He has the second best PER in the league behind Davis at 29.2. An important stat is win shares per 48 minutes, and there Westbrook is 4th, trailing contenders Curry, Davis and Harden. James, surprise surprise, is only 16th. What else? In Box Plus/Minus Westbrook leads the NBA with 11.1 BPM is a box score estimate of the points a player contributes per 100 possessions above a league average player, translated to an average team. Similar to WAR in baseball, but not quite the same. But Westbrook is also highly inefficient, shooting only 43.7% from the field. He’s not anywhere near the top 20 in the NBA when it comes to true shooting or effective field goal percentage. Curry, for example, is a top 7 player at both. 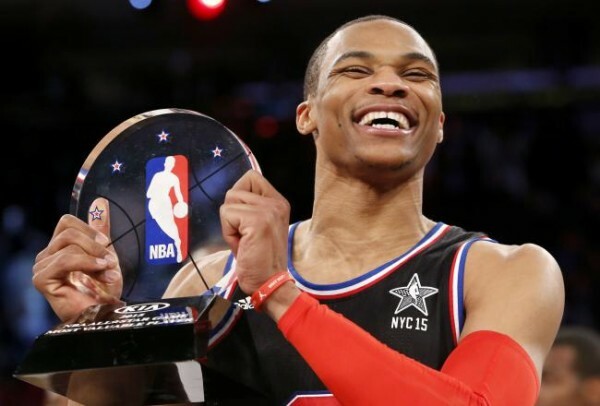 In the end, I don’t think Westbrook wins the MVP. He’ll fall short not because of ability or his numbers, but because of how this award is given and the perception of him. The Thunder will need to finish among the top five or four in the West for Westbrook to be seriously considered because it takes being on a more successful team to win the award. If Kevin Durant comes back the Thunder will climb that high, but Durant’s return is going to bite into Westbrook’s impressive dominance, which will be his downfall in this race.